As part of my reading of Norse myths and Gaiman after my re-read of American Gods, I read Odd and the Frost Giants aloud to my boys, nearly 8yo Drake and 5yuo Guppy. Read aloud to my boys after reading Gaiman’s American Gods last month. It’s a story (or myth, if you will) based on characters from Norse mythology. In short, a young man named Odd leaves his village and goes into the wilderness. Strange things happen when he encounters a fox, bear and eagle. My appreciation of it was heightened by having recently read D’Aulaire’s Book of Norse Myths, which explained a certain joke about a mare among other details. Guppy said he liked it “medium” but Drake really enjoyed it, as I continue to struggle with figuring out age-appropriate read-alouds for these two. I borrowed D’Aulaire’s Book of Norse Myths from the library to read along with Neil Gaiman’s American Gods, which I remembered had a great number of references I wasn’t familiar with. I don’t recall reading the D’Aulaire’s Norse Myths as a child, though their Book of Greek Myths was one of my favorites. The new edition of the Norse myths has an introduction by Michael Chabon (which is also collected in his Maps and Legends) and was such an engaging, fantastically illustrated book with great stories that I went out and bought a copy for our home library. I don’t remember having this growing up, but I want my kids to. It indeed contributed to my enjoyment of Gaiman’s American Gods, as well as his Odd and the Frost Giants, which I just finished reading aloud to my two boys. After I finished reading The Mouse and his Child to 5yo Guppy and nearly 8yo Drake, I cast about for another book, and when I said “Narnia” Drake perked right up. I was torn between reading them in the order I read them growing up, which was chronological by publishing date. But I have a hardcover set that puts them in order by the events of the story. Since Drake can be a stickler for things like that, and I didn’t feel like arguing, we started with the book labeled 1, The Magician’s Nephew; the story takes place before that in The Lion, The Witch and The Wardrobe. 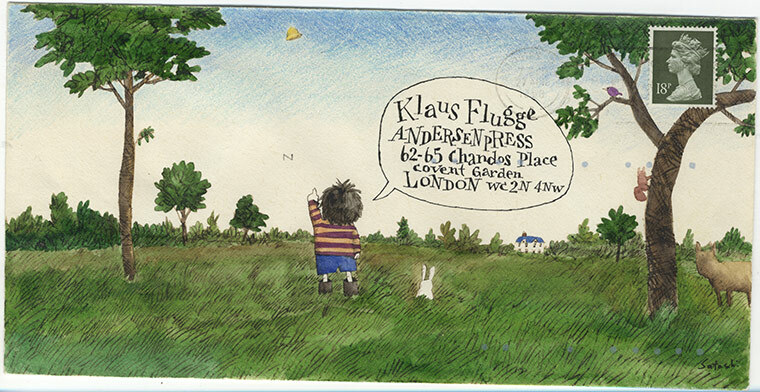 A young boy named Digory moves to his aunt and uncle’s house in London when his mother falls ill. He makes friends with Polly, the girl who lives next door, and they discover that Digory’s uncle is trying to find ways to travel among worlds. The uncle tricks the children into exploring for him, and their adventures include a dying world, a wicked witch, a just-created world, talking animals and much more. Christian allegory, which I didn’t recognize so clearly when I read this as a child, abounds. It is a solid adventure story featuring interesting child protagonists confronted with a variety of moral and ethical dilemmas. There is some humor, but it was more apparent to me, the adult reading the book, than to my young children who listened to it. I enjoyed revisiting the book. Their verdicts? Drake said he liked it and was interested in the next book. Guppy was grumpy, and said he did not, so I may have picked a(nother) book he’s not yet ready for. I’ll keep trying. Next up is Neil Gaiman’s Odd and the Frost Giants. My family recently drove to Ohio and back. 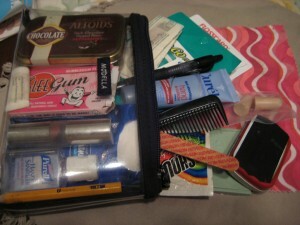 Packing well is the key to making it, which includes both packing food and packing for the trip. The last time we took the car, I thought, “Hey, we have the car! Let’s bring the boys’ scooters, and helmets, and…” The car was full, we could never find anything, and I think we forgot several things when we left. This time, I packed sparingly. Five outfits for 9 days for each of us. No wheeled vehicles. I put a couple dozen CDs is a holder, and did the same with DVDs for the player we got for the boys. And the ride went great. Except for traffic around Chicago, which seems to be a level of hell on earth. On the way out, we went 60 miles in 3 hours. Excruciating. We stopped once about every 2 hours, but never for long. I’d packed enough sandwiches and snacks and filled all our refillable water bottles; we didn’t buy any food going out or back. This is good, because when I get hungry and am traveling, my food consciousness goes missing and I think something like, “Mini can of pringles, grape gatorade and snickers ice cream bar. Awesome!” It’s like I’m flashing back one of the few (no, really) times in my feckless youth that I “ate a sandwich.” Apparently when I travel, I get off my local-organic high horse and put her in the stable while I’m away. 1. Ask the kids if they need to relieve themselves BEFORE we pass the rest stop. Nothing like passing the sign and thinking, “Heh, we’ll totally make it another 47 miles.” only to hear a voice from the back seat declare otherwise. 2. Traffic around Chicago is just dreadful. I don’t know what savvy people do to avoid it, as we were driving mid day both ways, but I’m going to research it before we do that drive again. 3. Toft’s ice cream is really, really good. 4. Not a lot of people from North Dakota on the road. Way more people from the south and east coast traveling west. Also, stupid license plate frames make some plates hard to see. We had to look up Great Faces, Great Places on my husband’s smart phone. 5. When I get back to writing fiction (which is supposed to be this fall when Guppy starts kindergarten) and if I ever need to make up character names, I need only consult a map or go on a road trip. The exit-name pairings are a goldmine: Constantine Middlebury, Madison and Dane DeForest, Clayton Trotwood, Phillip Greenville, though some, like Brice Reynolds and Kirk Baltimore, sound like they might have a future in adult films. I may have to do a post just on these, which entertained me greatly. 6. I am unable to see signs for Menomonie WI without singing Mahna Mahna. 7. I am unable to see signs for Rockford IL without humming the Rockford Files theme song. 8. Car dvd players are amazing pieces of technology. I can only imagine how much less pleasant the trip would have been without them for the boys. But I’m so glad I listened to a friend’s advice: put off taking them out as long as possible, or even that magic wears thin. A friend of my husband, G. Grod, is moving soon. He offered his collection of vintage Star Wars toys to our boys, 5yo Guppy and 7yo Drake. (And 39yo G.) We, of course, accepted this stunningly generous offer with alacrity. The boys have been playing with them for the last few weeks in great delight. A few weeks ago, in the shadow of some writing deadline, I yelled at the rambunctious boys to go play outside. No alarm bells went off in my head; I was awash in relief. The boys went to the back steps. I left them playing happily there until it came time to leave for Guppy’s tumbling class. Drake was especially excited to go, as I was going to let him play with the gameboy. I went out the back door and found the boys in the back yard, not on the back steps. “Time to go!” I said. “We lost the toys,” they said. 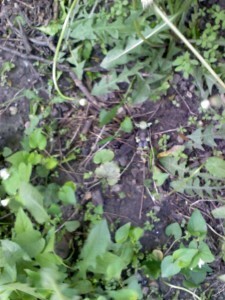 I looked around our backyard, covered with high grass and higher weeds. I stifled the urge to scream. We found eight with relative ease. Walking slowly we (and by this, I mean mostly me) found four more. Only two remained at large, a snow trooper and Yoda. The time for tumbling class had come and gone. Guppy took it in stride. His older brother, deprived of a planned-for video session, had a meltdown, which I ignored. My husband arrived home from work. I put him in charge of the search party and left for a movie. When I returned home, G said they’d found the snow trooper in the rhubarb. I had figured the snow trooper was going to be easier to spot than Master Yoda, who is green, dressed in brown, and small. Yoda’s lost and must be found. Please help us find Yoda. (Insert lost item instead of Yoda; you get the idea.) But we did not find Yoda. I looked. The kids looked. G looked. Days passed. Then came a very windy day. The latch on our back storm door was broken, so the wind kept blowing it open and slamming it shut. I heard glass break, looked out our back door, but didn’t see anything broken. I thought the storm door panels were made of plexiglass. But one had been glass, as I found out when G. next used the back door and found the glass on our back steps and in the nearby flower bed. 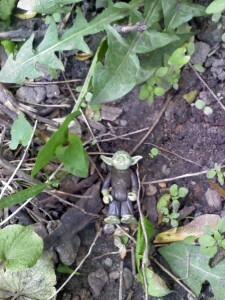 When I went out the next day to pick up the glass, I cherished a small hope of finding Yoda. I’d be working in the area Guppy said he’d last been seen. I looked from above; no Yoda. I bent at the waist; no Yoda. 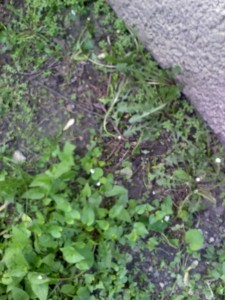 Only when I crouched down, picking up the smallest pieces, did I finally see him. Master Yoda, lying face up, patiently waiting to be found. Here’s the close up of where he was. Looks obvious, right? But what about medium distance? Is he still easy to find? We rinsed him off and returned him to his carrying case. Then I said thank you to St. Anthony, though I thought breaking our storm window was a little extreme, and decreed that from that day forth, the Star Wars toys were INDOOR toys. Tuesday is usually the day I have to myself for writing and making plans, like the tea a neighbor had invited me to. Just before 1 p.m., I weighed my options, then asked Drake if he’d be OK if I went a block away to tea. He said he’d like to come with me, which wasn’t ideal as she had two younger kids at her house that I didn’t want to potentially expose to a virus. I told him he could have an hour of computer games while I was gone. He rapidly agreed to stay home. We practiced using the phone, both answering and calling. I quizzed him on what to do in an emergency as well as what qualified as emergencies–pretty much burglars, blood, or fire. We discussed trust and responsibility. And then I locked the house and went over to my friend’s house for tea. I called after 30 minutes, though I had to call twice to get him to answer; he said he couldn’t find the handset. And I came home promptly after an hour. To find him in the exact same spot I’d left him in, playing a game called Crazy Taxi. I’m sure some parents would think leaving a 7yo alone for an hour while I was a block away was no big deal, while others might think I’m shockingly neglectful. I fall somewhere in the middle. I tried it; it went well for both of us. My experiment returned meaningful results, albeit within a particular set of circumstances. I don’t think we’ll need to repeat this on a regular basis, but I thought it was a promising start. Four years ago, when Guppy was one, my doctors, therapist and I were trying to manage what turned out to be more than a run-of-the-mill post-partum depression. Instead, a long-standing seam of depression and anxiety had been opened up by the seismic shift of having a second child. As we worked through what was needed for treatment, I was told again and again by friends, doctors and counselors: it gets better. Especially around the time they’re five and seven. Many also admitted to me that they hadn’t enjoyed parenting very small children, and it was only as time passed that they settled into their role as parents. Four years ago, four years seemed a very long time to wait till things got better. And the time, for me, has not chirpily flown. It has passed, one day at a time. Slower with diapers, bloody noses, fevers, screaming, and each extra syllable added to Mom!” Faster with cuddles, reading aloud and hand-holding. Fastest of all in quiet moments to myself, like the one I’m in now. But it has passed. My boys are now five and seven, and I’m here to testify: it _is_ better. It’s no coincidence that the shift takes place when the younger is five. They can do many things themselves, especially going to the bathroom, and don’t need constant supervision. They’re able to reason, and play with others. They’ve got some impulse control. And being in school (my younger will start kindergarten this fall; we don’t know yet whether he’ll be in full or half day class) means they get more peer interaction, and I get more quiet time. For this introvert, quiet time on my own is critical to balance and well being. I’m under no illusion that things will be rainbow and sunshine from here on. Other parents also say that while some things get easier as they grow, others get harder. But I feel much better equipped to handle the current challenges than I did the old ones. So add my voice to the chorus. When the youngest is about five, it gets easier. I’m glad we’ve all hung in there to find this was true. My younger son, 5yo Guppy, has recently become enamored of baby loons. He saw a picture of a baby taking a ride on its mama’s back in a book and hasn’t stopped talking about them since. So when I saw Loon Baby, written by Molly Beth Griffin and illustrated by Anne Hunter, on display at Magers & Quinn, I showed it to him and asked if he’d like me to get it for him. I had trouble prying it away from him so the bookseller could ring it up. We read it at bedtime, and he took it to bed with him. You can see the result, above. Loon Baby is a sweet story about a mother loon and her baby out on the lake. The mother goes for food, but the baby is too small to dive, so can’t go with her. When she is gone a long time, he worries, then becomes lost. Only when he begins to cry is his mother able to find him and they return home to their warm nest on the lake. I’m a Minnesotan now, so the setting of a north woods lake fills me with longing for a trip to the shore. The text doesn’t rhyme, but has distinct rhythms that make it a pleasure to read aloud. The breeze ruffled his fluff. It does, however, bear more than passing similarities to other missing-mother-bird stories, especially Come Along, Daisy and Owl Babies, two long-time favorites in our family. 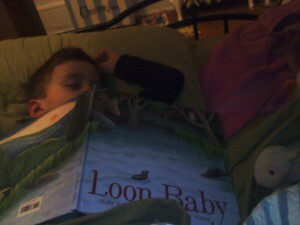 The family bookshelf has more than enough room for ones as charmingly told and illustrated as Loon Baby. But could we have a move away from the absent-mother-and-worried/lost-child motif, please? and everyone was at the table. Father was eating his egg. Mother was eating her egg. Gloria was sitting in a high chair and eating her egg, too. Frances was eating bread and jam. “What a lovely egg!” said Father. Frances the badger does not like eggs, or most other foods. She asks for bread and jam instead. But when she begins to receive bread and jam at every meal, Frances learns the perils of getting what you want. This book has so many things: charming pictures by Lillian Hoban, an amusing, yet gently instructive tale by her then-husband Russell Hoban, several songs about jam, and (as Kate Moses pointed out in her touching memoir Cakewalk) a story about food and its role in a happy family. My mom read this to us when my sisters and I were girls, and she made up tunes to go to the songs, just as I’ve done for my sons. The second book was given to us by my sister Ruthie some years ago. It’s the deceptively simple Two Eggs, Please written by Sarah Weeks and illustrated by Doreen Cronin, the illustrator of the Click, Clack Moo books. It’s 2 a.m. in a downtown diner. A brown bear is in the kitchen, a red fox is out front. One by one, customers trickle in; they include a taxi-driving rhino, an upright-bass playing mouse whose band has probably just finished a set when the bar closed, a construction worker ram, and a homeless alligator and his pet snake. What do they all want? Two eggs, please. (And the “please” is pleasingly repeated.) They each get a nice, big cup of coffee but the egg orders are all different. 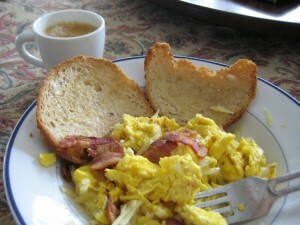 The chef is shown breaking two eggs, one brown, one white, and both the same on the inside. The simple, timeless message told with charming pictures and few words moves me every time, and I only hope its deeper message is planted and growing inside my boys, even as they enjoy the simplistic portrayal of a late night diner counter. I eat the same breakfast every morning: a cherry pomegranate toaster pastry and a cappuccino. About two hours later, I’m finally hungry for something more substantial, and that’s when I usually cook an egg. As often as we can, we get our eggs from one of Guppy’s preschool teachers, whose grandmother keeps chickens out in the country. 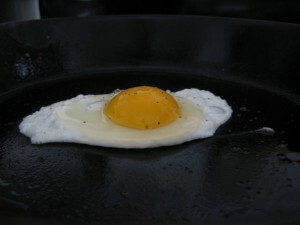 Check out this yolk: half as high as a golf ball, and yellow-orange like a hot sun. These are eggs from happy chickens. Note that I’m eating the heels of the bread, as the three other people in this family refuse to. Am I eating their leavings, or fortifying myself with the part of the bread that has the most nutrients? This week my younger son, Guppy, turned 5. He is, as I often tell him, a joy and a wonder. He is strong, sturdy, and independent. Last summer he rode a bike with training wheels, and this summer we’ll try to take them off, and see what happens. He learned to read this past year, though he often insists if I ask him what something says, “I can’t _read!_” (like the dog in the Snausages commercial). He went through a “tagging” phase recently, where he wrote his name on things all over the house. Including my library book. I’m often told he has a very cute speaking voice. His Ls and Rs are still a bit unclear; he tends to roll them, and the effect is sweet and funny, especially on names like Star Wars villain General Grievous. Obi-Wan is pronounced Obi-One, and Darth’s second name is Vater, but I’m sure these will be corrected in all good time. Like Drake (and because of him, I’m sure) Guppy loves comic books (though he insists he doesn’t like going to the comic shop), television, and video games (especially the Star Wars Lego ones). He is often sweet and affectionate, and is generous with his hugs. He is very much looking forward to day camp this summer, and kindergarten in the fall. And readers, so am I. I love Guppy, but I also love having time apart from Guppy, and I’ll be interested to see how his individuality grows as he moves further out into the world. Your existence is a delight to us. 1. Kids are going to get sick sometime, so even if they’re babies, they’re just building up immunity. Why this is ignorant: while technically true, it fails to take into account that babies are smaller and more vulnerable physically than bigger kids. Their lungs are smaller, and ear tubes shorter. The older a kids are when they get sick, the better their bodies will handle it, barring extenuating circumstances. I.e., if a baby and an older kid who get sick at the same time, all other things being equal, the baby will get sicker, and for longer. For example, if a baby gets a cold, it often leads to an ear infection that won’t clear up on its own. A bigger kid might just get the cold, no complications. Also, if your baby gets a cold now, its immune system is depressed, and less able to fight off additional exposure to viruses in the short term. This situation is exacerbated in winter by more exposure to people and less exposure to sunshine (vitamin D) and fresh, copious amounts of air. My interpretation: no need to be paranoid, but take reasonable precautions to prevent your baby from getting sick. Don’t let a sick person hold them, or at least without washing hands. Don’t take your baby around other kids who are drippy and sneezy. And for all kids, respect guidelines like keeping kids home 24 hours after fevers or vomiting. 2. “You know where your baby is in the bed.” I’ve found this vague defense of bed sharing is ALWAYS voiced in the second person, and followed by a variation on “the only cases where kids are rolled on is when someone is obese, drunk, or both. My interpretation: Throughout history, lots of people have bed shared with infants with no ill results. But some babies have died from it–parents drunk, obese or not–and not every single person “knows” where a baby is in the bed, especially when sleep deprived with a newborn. Your experience is not someone else’s, and it’s not a thoroughly researched double-blind study with zero casualties. Sharing the bed with my baby wasn’t for me. Maybe it is for you, but use the first person and don’t generalize. Don’t get me wrong. I’m sure I’ve said these things. I’m not immune to small talking; I probably still say things like them. BUT. I have learned that just because I can’t imagine something doesn’t mean it isn’t true for others. Rather, it’s a failure of imagination and lack of experience on my part. There is something about watching the same shows and movies every year that is a big part of holiday fun for me. And with DVDs, and no commercials, the experience is easier, and more enjoyable. I did a previous entry on family holiday movies, but we’ve continued, sometimes with all four of us, and sometimes with just my husband. And with It’s a Wonderful Life, it was just me. National Lampoon’s Christmas Vacation: I’d never seen this before, which is strange, given how many, many times I’ve seen the original recipe. Funny but mostly forgettable, with a very young Johnny Galecki, Juliette Lewis, and a very big-haired Julia Louis Dreyfus. Holiday Inn. Bing Crosby and Fred Astaire fight over girls. I’m on team Fred. His dancing is way cooler than Bing’s singing. Most famous for its introduction of “White Christmas”, but less famous than the film of the same name, since this one has a troubling sequence in blackface that was interestingly edited out of the version we watched on AMC. Year without a Santa Claus. Heat Miser and Snow Miser. The kids enjoyed this one, and it reminds me fondly of being a kid at Christmas. The Shop Around the Corner. MY FAVORITE HOLIDAY MOVIE. Anyone who doesn’t smile and laugh during this romantic comedy is a grinch. There’s sad stuff, too, but really, the whole thing is just lovely. If you haven’t seen it, do. It’s a Wonderful Life. Only the second time I’ve seen it, I was again struck by the very dark undercurrent that’s easy to ignore with its “happy” ending. George Bailey dreams of getting out of his small town and becoming an architect. Instead, he stays and works at a savings and loan, gets married and has four kids. While I love, love, love the scene when George and Mary are walking home from the dance, the rest of the film is depressing, the more I think about it, e.g., he’s still going to have to pay back the $8000. I’m going to try and watch Meet Me in St. Louis, and I think that’ll be all for this year. I’ve never yet seen A Christmas Story or Scrooged, and I’d like to see Love, Actually again, so I’ll keep them in mind for next year. I have fond memories of watching Rudolph and the other animated specials every year, so I’ve been slowly building up a library of holiday movies for us to watch as a family every year. My husband G. Grod isn’t so into the whole every-movie every-year thing as I am, but we all know he’s not as compulsive as I am, either. And aren’t holiday traditions all about the compulsivity? We started off with Rudolph the Red-Nosed Reindeer. This year nearly 5yo Guppy wasn’t scared of the Bumble, and both boys enjoyed it. And on IMDB, I found the answer for why “Dolly for Sue” is on the Island of Misfit Toys: “This gripping debate raged on for decades, until official word from Rankin-Bass recently decided the issue: Dolly for Sue is a “misfit” because she has psychological problems - she feels unloved.” Also, another burning misfit question answered: “When the elf drops the blue train from Santa’s sleigh, he no longer has the caboose with square wheels, the one thing that made him a misfit. Also, the bird who couldn’t fly is shown leaving the sleigh without an umbrella. Though not stated, it could be implied that Santa was able to use his magic to fix the misfit toys’ problems.” And the misfit scene at the end was added on after viewers protested that they weren’t revisited in the original. Nowhere on IMDB does it address why it’s Herbie at the beginning of the show and Hermie later on. The 1965 A Charlie Brown Christmas was a harder sell. 7yo Drake remembered not liking it, and was bored and flopsy for most of it. He perked up for the 1992 sequel It’s Christmastime Again, Charlie Brown which not only is not good, but contradicts the anti-commercial message of the first one. Inexplicably, the boys preferred the sequel. Next was The Muppets’ Christmas Carol, with Michael Caine as Scrooge and Kermit as Bob Cratchit and Robin (*cough, cough*) as tubercular Tiny Tim. Guppy had some time behind his hands and under the blanket during the many ghost parts, but did OK. Drake remembered much of it from the previous year. I enjoyed the Marley brothers, Jacob and “Robert” who were surrounded by noisy cashboxes in a tribute to Bob Marley and the Wailers. I chose Miracle on 34th Street next. Guppy’s refrain throughout was “when is the exciting part?” I told him it was the courtroom scene. He did not agree. Drake was mostly bored during, but enjoyed the ending. I think this is more a grownup than a kid movie, or at least little kid movie. Last night, we borrowed Elf from a friend. I thought it would be a hit, with its childish humor. Instead, Drake hid under the blanket every time Will Ferrell did something embarrassing (i.e., almost every scene) and continually moaned “I hate this movie!” He did not, though, leave the room though we suggested it more than once, and did cop to liking the ending. Again, not so much for the little kids, and maybe never for Drew, who couldn’t stomach the awkward comedy like that of Will Ferrell and The Office. Next I’m going for Emmet Otter’s Jug Band Christmas. G. Grod has declined to join us. But I think this will be a bit more kid friendly. Hey, I’m posting this four days earlier than I did last year! Woo hoo! For all those other parents who aren’t quite finished buying gifts for their kids, here is the article I love best on what (and what not) to get them. I have learned to live with levels of dirt, mess and laundry that I previously would not have tolerated. Writing is on my Maslow’s list of basic needs somewhere after sleeping, eating and reading. I do use the TV as a babysitter. As I write this, my boys are playing Gran Turismo on the Playstation downstairs. But isn’t that fair? I’m having screen time, so are they. Yeah, I’d like to restrict them to an hour a day. Most days I do. But how can I do that when I don’t restrict myself to that, and wouldn’t want to, or even think I should? I have been writing for years. I’ve been published in other places beside this blog. This year, for the first time, I began to be paid for some writing. I am a writer. And writing with kids is hard. They’re smart. They recognize they’re not getting my attention, and clamor more for it till they get it, for better or worse. A friend of mine had her 3yo throw her laptop on the ground. So I find ways to squeeze it in. While they’re watching movies. Playing outside. My husband and I trade off chunks of time with them so the other of us can work. I trade playdates with other moms on a regular, scheduled basis so I get chunks of time to work; I work better in chunks than in slivers. I write. I keep writing. Writing begets more writing. It’s a habit, just like exercise. It IS exercise. I’ve put fiction on hold till my 4yo Guppy is in school full time. That may be Fall 2011, or if he only gets into half-day kindergarten, it may not be till September 2012. And for all those platitude-spouting people who say the time goes so fast? I don’t find that’s the case; September 2011, and definitely 2012, feel a long way off. The only time I find going fast is the quiet time apart from kids when I take time to read and write. I love my kids and spending time with them. I am fortunate enough to be a stay-at-home mom by choice. But I also love spending time by myself. And writing. Of the two, guess which of An Education or Goonies we watched for family movie night? Both had their merits, as well as drawbacks. An Education is the Nick Hornby penned adaptation of a school memoir by Lynn Barber. It has great performances by Carey Mulligan in the lead, Peter Sarsgard as the older man with the shady past, and others. So it’s a surprise that a film full of good performances felt flat to me. Several montages, plus the classical music score that made obvious emotions even more so, made me lose interest in this mostly predictable film. Only OK, with some good bits about it. “What about Princess Leia?” asked my husband G. Grod. Guppy sighed. “_Disney_ princesses.” he said, as if this were obvious. While I’m thrilled to have raised a child averse to Disney princesses (could I have done this with a girl? do I have that kind of power?) I did want to watch our collector’s edition of Snow White. So we went to the video store as a family (because I cannot justify even the lowest level of Netflix given how many unwatched dvds, e.g., Snow White collector’s edition, we own), stood around, picked things, argued, ogled the candy, and all in all spent way more time than we’d planned to there. It was kind of nice; who does that anymore? But I suggested the Steven Spielberg produced, Richard Donner directed Goonies, because I knew it was a childhood favorite of G. Grod’s, and because I’d never seen it. The kids agreed. The Goonies is an 80’s movie about eviction, rich kids vs. poor kids, pirate treasure, robbers, and a chained monster who lives underground. It’s kind of like an action/adventure middle-school version of The Breakfast Club and St. Elmo’s Fire. There were a few scary bits beyond my boys’ comfort zone (a corpse and the monster, but the gunshots didn’t faze them), but it was mostly enjoyable for them. The biggest drawback for me was the bad language; these kids were dropping four-letter words like crazy. Nineteen “shits” and that doesn’t count various “asses” and others. While I did the same thing in middle school, it’s not behavior I want to highlight for my kids. In the end they really enjoyed it, so I count it as a win. If you do rent this, be sure to watch the Cyndi Lauper video on the extras. It is jaw-droppingly bizarre, as if a high-school tv class made a video on a Spielberg set that just happened to star Cyndi Lauper, pro wrestlers, and the Goonies kids. And Benihana chefs. As I wrote about recently, I’m trying to start a family movie night tradition. In theory, it’s supposed to be on Friday after pizza, but in practice it’s kind of jumping around a bit and not attached to one particular food yet. But I’ll keep trying. A few years ago, I tried to watch Mary Poppins with Drake, who was maybe 4 or 5 at the time. He was frightened by the booming cannon at the beginning, and refused to watch again till last weekend. So it was with some hesitation that I popped in the 139-minute movie. But both 7yo Drake and 4yo Guppy were unperturbed, and we went on to watch the first half of the movie, which included the classics “Spoonful of Sugar” and “Supercalifragilisticexpialidicous,” which Drake had a hard time wrapping his mouth around. Funny, how my husband G. Grod and me must have had to practice as children too for it to come so trippingly off our tongues as Drake struggled. We saved the second half for the next night, and it went just as well. The kids were delighted with it. I have been less delighted to find myself with some of the songs stuck in my head this week, but I hope that will pass. The kids were less delighted when I borrowed John Sayles’ Secret of Roan Inish from the library. They were happy to watch the cute seals, but the long intervals of storytelling and flashback were too much for them. The main character, Fiona, is such a brave, scrappy little girl I think this is a good girl-power movie. But probably for older kids than 7yo Drake.